Rarely have we heard a tape with such clarity of expression and depth of emotion as this set of eight tracks recorded in August 1984. Maybe Mental is two people: Donna Oliphant displays a vocal style that is bold, gripping and horrifying, one of the very best vocalists in indie music; David Oliphant who wrote most of the music here and programmed the savage rhythms, synths and otherworldly tape manipulations. ANIMISUM II captures to horrors of psychological self-cannibalism, of those times when the mind locks all doors on itself and devours itself in the emptiness of its isolation. This is a very exciting, well-produced and conceived K7 by an outstanding new group. 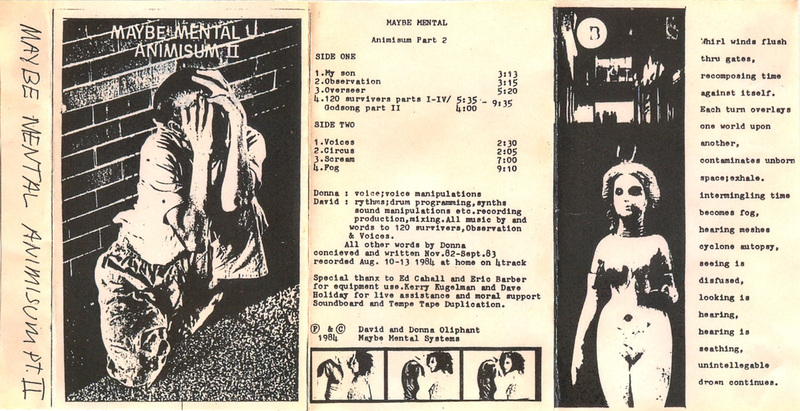 S/M Operations At The Harrington Ballroom was listed in the January 1985, May 1985, November 1985, and Summer 1986 Cause And Effect Cassette Distribution catalogs. It is presented here strictly for archival, educational, historical, and non-commercial purposes. All rights belong to the artists. These recordings are straight transcriptions from what is apparently a copy of an original copy of the cassette as it was published by Maybe Mental in 1984. No attempt has been made to enhance or "improve" the sound quality. Pictured above is a copy made from an original copy of Animisum II. The cover has discolored/yellowed somewhat due to age.